Hartline has some ability but he has too many question marks including an off-season arrest for me to project him to be drafted. Positives: Hartline has solid size and athleticism for the position, as well as above average arm strength and accuracy. He has a good amount of starting experience and he operated a pro-style offense at Kentucky which will help him transition to the NFL. He flashes a solid feel for the pocket and has a good enough feel for the rush to side-step a rusher if he comes free at times. He will also step up when he feels pressure coming off the edge. He is a threat to gain yardage with his legs when flushed from the pocket, and throws a solid ball on the move when he keeps his shoulders square. Negatives: Hartline has some off field concerns as he was arrested for disorderly conduct and public intoxication before Kentucky’s bowl game and was not allowed to participate in the game against Pitt. As a QB he is just an average player though, as his accuracy is inconsistent, he doesn’t throw a good deep ball and his footwork needs improvement. He regularly throws off balance on the run and in the pocket when there is pressure coming at him and that causes a lot of his deep passes to float. Additionally, his mechanics can be inconsistent and at times he has a hitch in his throwing motion when he dips the ball down below his chest which elongates his throwing motion. He struggles when there is pressure in his face and doesn’t make very good decisions in these instances. His decision making overall is questionable and while he was relatively productive at Kentucky I don’t think he has a strong future as a NFL starter. Overall: Hartline has some ability but he isn’t very fundamentally sound and while I think he has enough talent to be a practice squad guy that eventually sticks as a #3 in the NFL I don’t think he will ever be a starter. He needs to work on his fundamentals (cleaning up his throwing motion and his footwork most notably) to even stick as a #2 at some point, plus his struggles with his decision making (especially under duress) will make it hard for him to ever have success as a starting quarterback in the NFL. Projection: Undrafted. Before he was arrested he may have had a shot to be drafted in the 7th round, maybe a bit earlier in this disappointing QB class, but with that serious off field issue just a few months before the draft I would not be surprised at all to see him go undrafted. Derrick Locke is an ideal 3rd down back in the NFL in my opinion. Positives: The best word to describe Locke is fast. He is extremely quick, has a great burst, impressive change of direction speed and terrific straight line speed to top it off. He is very dangerous in the open field and does a good job of making guys miss and cutting to find room to run and seems to have good vision as a runner. He runs patiently and lets his blockers get into position before he makes his cuts, and does a good job of finding a seam or room to run even when there isn’t much there. Despite his small size Locke can still get some yardage after initial contact and can run through arm tackles in the open field because of his speed and leg drive. He is also a big threat as a receiver out of the backfield because of his terrific acceleration, and once he gets the ball with a little green in front of him he covers a lot of yardage in a flash. He catches the ball well in the flat and even caught a couple long balls from Hartline, so he should be a threat on wheel routes in the NFL. He offers some ability as a pass blocker, but I haven’t seen him in this capacity very much. Negatives: Locke’s small stature is obviously going to be questioned because he got nicked up as a Senior and missed some time, and durability will be potential issue for him in the NFL. He will probably be a 3rd down back in the NFL and a guy that is more of a complementary back than a full time starter. There will be questions about how effective he is at running between the tackles because of this, however he was an effective inside runner as a college player so hopefully that won’t be an issue. However, he does tend to bounce runs outside a lot and that will hurt him in the NFL where he will be facing defenses with much better team speed than he faced in college so it will be harder to bounce runs outside as consistently as he did in college. Overall: Locke has a lot of ability and I think he will be a very effective 3rd down back in the NFL. I don’t know that he will ever be a starter, but I think he can be an effective change of pace back for a long time assuming he avoids serious injury. He has game-breaking speed and quickness and that is going to make him very valuable as a runner (especially once the defense is worn down a bit) and as a receiver out of the backfield. He also returned kicks at Kentucky though I do not know if he will do that in the NFL, but he was effective when doing so in college. With Locke what you see in college is largely what you are going to get in the NFL as he is pretty fundamentally sound. That limits his “upside” but it means he should be able to come in immediately and contribute as a rookie which makes him a very intriguing option in the middle of the draft. Projection: 4th-5th round. I don’t know where he will go in this range, but I think he would be a great value in this range. He will be able to come in and contribute as a rookie, and I could really see him being thought of as a steal in the future if he goes this late. Cobb is as versatile a football player as you will ever find, and that figures to make him very attractive to NFL teams. Positives: The first thing you have to notice when you watch Cobb is his versatility. He lines up at QB in the wildcat, he plays wide receiver, he runs the ball from the wildcat and on reverses, he returns kick-offs and punts, plus he is the holder for extra points and field goals. That versatility is incredibly intriguing, plus he is a very elusive runner with the ball in his hands. He has good vision as a return man on both punts and kick-offs, plus he does a good job at finding seams as a runner and as a receiver running after the catch. He shows pretty good speed, though it isn’t elite, and changes directions fluidly and shows quickness as a route runner and as a ball carrier. He is very good at running after the catch and gaining yards after he gets the ball in his hands, and while he may not run through a lot of tackles he does a great job of avoiding them due to his natural feel for running with the ball. He catches the ball well with his hands and can make catches away from his body. He seems to time his leaps well and can high-point the ball in the air and can make catches in traffic. He also can absorb hits and hang onto the ball, which means he shouldn’t have a problem going over the middle in the NFL. He flashes the ability to create separation as a route runner, and he also flashes the ability to make some very impressive diving or one-handed catches as a receiver. 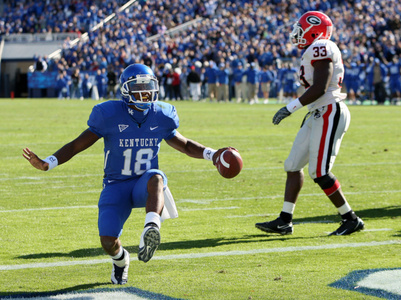 He is also a very consistent return man and he rarely seemed to be tackled before the 30 yard line on kick-offs, which meant a lot of relatively short fields for Kentucky’s offense. He also gives a pretty solid effort as a blocker downfield. Negatives: While Cobb may be a special athlete he doesn’t have elite speed which hurts him when trying to create separation and may limit his potential to be a very effective return man in the NFL. He struggled to create consistent separation when running routes which made it hard for him to get the ball. Sometimes when he runs routes he just doesn’t look very fast, but then he seems to have another gear when he is running with the ball in his hands. I think he can learn to be an effective route runner, but he will need some coaching up to become a good one. I think he has the quickness necessary to run good routes, he just has to work at it. This also isn’t a serious issue, but Cobb could work on ball security once he gets to the NFL. He usually has the ball pretty secure, but he fumbled a couple times in the games that I saw of him as a junior. Cobb will occasionally drop catchable passes which definitely isn’t a reflection of his hands which are good, I think it has more to do with a drop in concentration or more likely with him rushing to catch the ball so he can make a move to get yardage after the catch. He also muffed a couple of punts in the games that I watched of him as a junior and while he doesn’t usually have a problem with that I think it was because he was looking to run before he had control of the ball. Overall: I am a big fan of Cobb. I have been trying to bring some attention to his abilities since last June after I watched a couple of his games as a sophomore. I was actually watching them to try to evaluate Mike Hartline going into his senior season but Cobb just jumped off the tape and I have been high on him ever since. He may not be an elite athlete as far as his 40 time and other tests are considered, but when you put a football in his hands he will make guys miss and get yardage after the catch or after he fields a punt. He is such a fluid runner with the ball and he is so elusive that it is just fun to watch him make plays in the open field. I love his versatility and I think a lot of NFL teams will value that as well, and I really think he can be a special player in the NFL. He is just so valuable as a receiver, runner, return man and even occasionally a passer that I think he will have a successful NFL career if he continues to work hard. If he can improve his route running to help him create some more separation I think he can be a very good #2 receiver, though I don’t think he will ever be an elite #1 WR. Projection: Early-mid 2nd round. I would pick him in the late 1st round but I am a big fan of his, but I would be shocked if he made it out of the top 45-50 selections.